It was a bitterly cold and windy day, but true to it’s forecast the wind dropped just after sunset and the big fire was lit, banishing the cold and the dark of winter for another year. Based on long term traditions from Europe, the effigy of Marzanna, the Slavic goddess of Winter and Death, was sacrificed on the pyre to ensure the return of the sun and new life with it. Around 60 men women and children came to enjoy the spectacle, munch sausage sandwiches and enjoy the warmth and the friendship of the evening. A big thank you to Andrew from Blackman’s Creek Road who brought one of his telescopes along to show us the rings of Saturn in the clear winter sky. Quite a spectacle! The Raffle was very popular – nothing like the prospect of winning a trailer load of good firewood to brighten the evening. The firewood was won by K & K of Kanimbla and the Progress Association has in excess of $880 from ticket sales to spend on improvements to infrastructure around the Old School and Hall. A big thank you to Shannon & Erin of Erin’s Quality Ironbark for donating the wood. and the fourth prize, of a Hartley Big Backyard Tea Towel went to Alicia Braithwaite also of Little Hartley. and everyone else who helped to set up, put away and keep things running smoothly. This folk custom from Poland falls usually around the date of 20/21 March – when the Spring begins. It survived not only in Poland but also in Czech Republic and Slovakia. 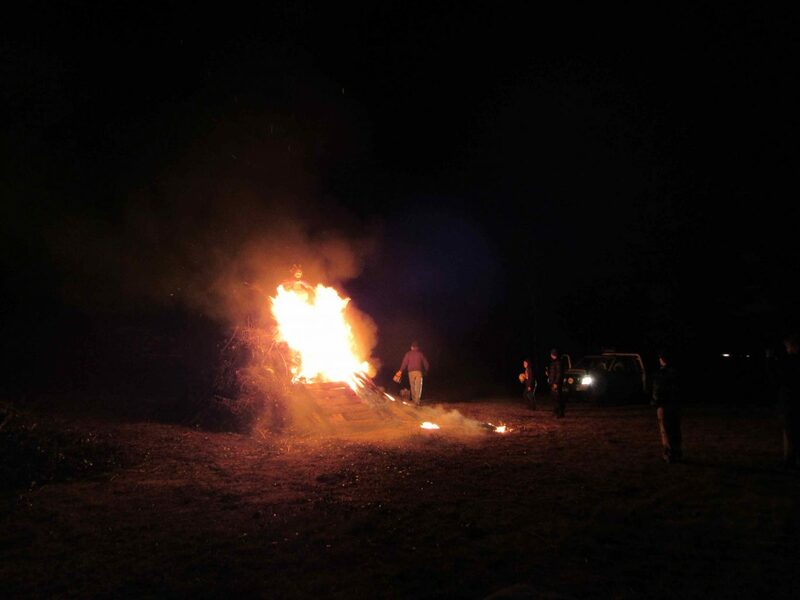 It has been introduced to Hartley by Margaret Combs who has twice created the doll-like effigy that has burned so spectacularly in the Winter Bonfire. The female straw effigy of Marzanna can vary in size – it may be a small puppet or a life-size dummy. The doll is set on fire, drowned in a river or both. The ritual is a symbolic farewell to Winter and the dark days that it involved. It shows joy of rebirth of Spring. It was believed that the ritual would ensure good harvest. Destroying the effigy of evil goddess was believed also to remove all the effects brought by her. According to the custom the straw effigy was placed on a stick and covered with linen. She was also decorated with ribbons and necklaces.